Witnesses have told the Finance Committee that radical solutions were needed to deal with the forthcoming cuts to the public sector budget and efficiency savings would not do enough to combat the reduction in funding. The committee was continuing its enquiry into the Scottish government's budget strategy for 2011-12 and how to improve efficiency in the public sector, on 20 April 2010. 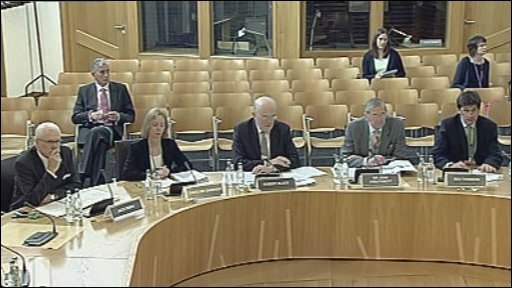 Robert Black, Auditor General for Scotland, told MSPs the "emerging gap" between public spending and forecast budgets could be between £1.2bn and £2.9bn in 2013-14. Mr Black said relying on the current 2% efficiencies savings would not be sufficient to deal with this. Ben Thomson, from Reform Scotland said that efficiency savings "don't necessarily scratch the surface of what is required" and called for "significant structural changes" to the public sector. Jack Perry, the former chief executive of Scottish Enterprise, said the public sector would have to leave behind the mind-set that led to incremental improvements in public services and rather adopt the more radical practices of the private sector. MSPs also quizzed Sir John Arbuthnott, author of Clyde Valley Review of Joint Working and Shared Services and Caroline Gardner, Deputy Auditor General for Scotland. The committee then heard from Don Peebles, from the Chartered Institute of Public Finance and Accountancy; Martin Southern, from BT Scotland; Colin Mair, from Improvement Service; Professor John Seddon, from Vanguard Consultants and Anne Houston, from the charity Children 1st.